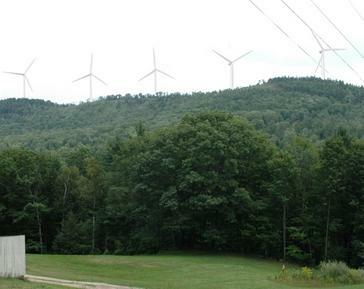 Update, 6/29/15: Recount reverses 3rd wind farm vote in divided Maine town. The drama continues in Dixfield, where a recount has reversed the recent approval of a more restrictive wind farm ordinance. The initial 5-vote margin turned into a 31-vote victory for the other side, with the final tally being 390-359, against the revisions. Town Manager Carlo Puiia and the chairman of the board of selectmen were both present for the recount; Puiia says, “There were several of us in the room, and a number of people were there as witnesses. I think we pinpointed where the problem was, and that this is an accurate count.” He added, “The Board of Selectmen will discuss this at their next meeting on July 13. My prediction is that they’ll continue to work off of what the Planning Board has already done. It has a lot of good stuff in it.” If so, then we can look forward to a fourth round of voting sometime soon; the faction in town that favors letting the wind project proceed has narrowly prevailed in each of the three votes held so far. The bad blood and distrust in town was highlighted in the days following the recount, when some locals became convinced that the wind company was immediately trucking turbine parts up to the site; in fact, the local project has yet to begin its lengthy permitting process, and the turbines were bound for a previously-approved project in nearby Carthage. The town of Dixfield, Maine has approved a new wind ordinance that includes setbacks of 4000 feet from neighboring residences, 2000 feet from project boundaries, and a night time noise limit of 35dB. The latter provision is said to be a deal-killer by Patriot Renewables, which planned to build a 20MW project on a ridge in town (picture shows simulation from 2 miles away). For the third time in less than three years, local voters were asked to approve changes in its wind ordinance; each time, the vote was a nail-biter. In late 2012, voters approved an ordinance that had 2000ft setbacks and sound limits in line with state guidelines of 55dB during the day, 42dB at night. (Ed. note, 12/2016: This ordinance remains the default rule; all the votes since then have sought to replace this 2012 ordinance, and all have failed.) During 2013-14, the Planning Board drew up a new proposal that increased the setbacks and tightened those noise guidelines; the Board of Selectmen made some amendments, including the addition of several low-frequency noise criteria; that proposal was narrowly defeated in late 2014. In response, the Selectmen decided to put the Planning Board’s initial proposal before voters with fewer additions. This proposal, including a noise limits of 45/35 dBA (day/night) and a 50dBC maximum, was approved this week by a 5-vote margin, 577-572. The first two votes were considered victories for those in town who want to see the project go forward. Indeed, the initial 2012 vote was framed on the ballot as a clear choice: “A yes vote means that the wind farm will be allowed in the towns. A no vote means that selectmen will begin the process of prohibiting wind farms in the towns.” The measure passed 651-622; the 29-vote margin would be largest of the eventual three votes, and this marks the highest overall turnout as well. However, this was a zoning measure, and the town was advised that it should have a regulatory ordinance instead. This is when the Planning Board revisited the topic, and the Selectmen added more stringent provisions; press coverage is unclear, but some reports indicate that the increase to 4000 feet was a Selectmen addition, and it’s unclear which Board reduced the noise limits. The final proposal included 42/35dBA limits (day/night), three criteria regarding dbC levels to address low-frequency noise concerns, and the 4000ft setback. When this more stringent revision was put to the voters in November 2014, it was rejected by a 14-vote margin, 567-553, thus retaining the 2012 standards as the ordinance in place. Selectmen decided to give voters another crack at it, after removing one of the dbC standards and slightly increasing the daytime noise limit to 45dB; this is the measure that passed in early June, with the closest margin yet, 577-572. Clearly, the town of Dixfield is closely divided on this issue. Such is the case in many small towns faced with the difficult decision of how to manage the arrival of what is often the largest industrial development to ever be proposed in their rural setting. While much of the vocal resistance to wind development focuses on the likelihood that some residents will be negatively affected by the noise, it’s also quite clear that many locals support stringent siting standards in order to maintain their sense of place and overall quality of life. Even at two miles (the simulation above, provided by Patriot), the turbines are a notable presence. Settling on 4000 feet, and a night noise provision that probably effectively creates a buffer of a mile or so, is a reasonable choice for a town that wants to minimize impacts, or give those who will be more affected a choice in the matter (the company can negotiate noise easements as needed). Other towns have gone ahead with smaller setbacks and higher noise limits, which is also a valid local choice; in these cases, there are often some residents who are strongly affected, and others at similar distances who are fine with the turbines. It really comes down to how precautionary a town wants to be. Only time will tell whether the third time was the charm for the cautionary contingent in Dixfield, or if this becomes just another step in the ongoing saga.